Lemongrass Luau | Kona Brewing Co.
i might be being a little generous on this one, but i liked it a lot, even with a little time on it, it holds up well and tastes fresh to me still, a wheat beer brewed with ginger and lemongrass, a nice islandy mix of flavors to be sure. golden brew with excited carbonation. ginger is prominent in the nose, somewhat natural but also sort of candied or candy-like rather, sweet in the nose but fortunately not in the flavor. the lemongrass is the opposite, less in the aroma more in the taste, juicy and citrusy and springy and very hawaii and almost relaxing to me instantly. this is super summery, i like how light the wheat malt is in here, flavorful but delicate and cleaned up really well, this is crisp almost like a lager, made even more refreshing with such high carbonation, which is awesome.the lemongrass is real authentic and the proportion is good, the beer is light and simple and the lemongrass highlights the parts of it that work well on their own. insanely drinkable, i could happily slam the whole sixer right from the bottle. i kind of lost track of these guys when bud sharted shoving it all over the place, but this is very good for what it is, maybe dial back the ginger just a bit, but its better than its ratings by a lot. Golden yellow, very little head. Smells and tastes strongly like lemongrass. Hint of ginger hits the back of your throat. I wish the ginger was stronger to be honest but I'm a big fan of ginger. I wouldn't go out of my way to buy this but I did enjoy it overall. Pours a clear gold with a white head. Smells of ginger, lemongrass, and spices. Tastes of malt, ginger, sugar, lemongrass, and other sweet spices. Medium in body and carbonation. Overall this is a very flavorful and easy to drink beer. 12 oz bottle. golden yellow pour with minimal head. Lemongrass aroma and taste. Went well with a Thai curry dish and I would probably like it with Chinese cuisine as well. 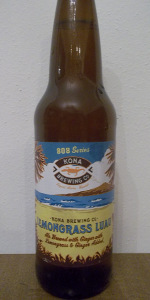 Lemongrass Luau from Kona Brewing Co.